As you’re welcomed to our new HOME page you can see large sliding photos of our shop and the latest lovely fabrics that are in stock. Most of these photos are “clickable”, taking you to the products. At the top of the page you can select SHOP to go shopping or scroll down the page to select a category you’d like to look at, there’s also a quick glance at “DIARY DATES”. At the bottom each page you can sign up to our e-newsletters & click on our social media links: Facebook, Instagram, Twitter. DELIVERY DETAILS & LINKS are also found here. Now the new website is live, we will be working our way through it, improving the quality of the photos as we now have larger photos. Our new website gives you the opportuntiy to create WISHLISTS by clicking on the little hearts on the top right-hand corner of each product. The Wishlists can be both private or you can select to share your wishlist with friends & family. At the top of each page is WORKSHOPS. 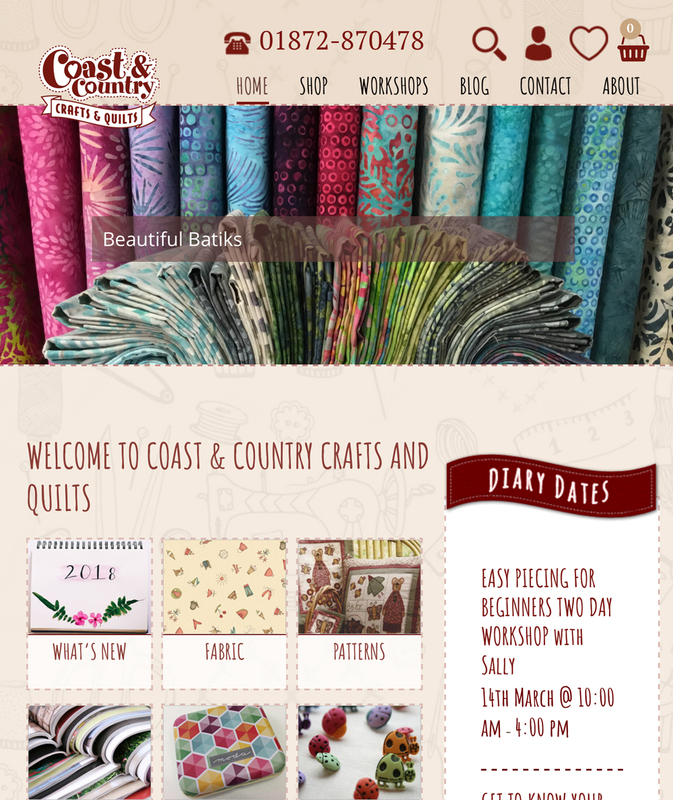 If you click on this you can view our Workshops month-by-month, as a list, or individually. If you look at the month-by-month view, use your mouse to hover over a date with a workshop on, & you’ll see a brief description & a photo pop up. You can click on each date to see more detail & a larger photo. Call the shop if you’d like to book on our lovely workshops 01872-870478. If you’re reading this, you’ve already found our BLOG! Visit regularly to see what we’re up to. GIFT VOUCHERS are available to buy on our website that are remeedable both on line & in-store. We can also offer COUPONS for special offers which will also be shown in some of our magazine adverts, so keep an eye out for them! We hope you enjoy browsing our New Website. We’ve tried not to change too much to keep it easy-to-use, just like our old website was.